What are PBDE’s and why should I be concerned? PBDE’s are chemical compounds that are used as flame retardants. They can be found in almost anything that carries an electrical current or is highly flammable. They’re in, for example, your TV, your computer, your cellphone, your car, your toaster and your sofa. PBDE stands for polybrominated diphenyl ether – a compound which contains bromine atoms. PBDE’s come in different forms, depending on the number and location of the bromine atoms. There are 209 possible variations. Often in the U.S. PBDE’s are marketed with trade names such as DE-60F or Saytex 102E (among others). Variations of the polybrominated diphenyl ethers (PBDE’s) include pentabrominated diphenyl ethers (pentaBDE’s); octabrominated diphenyl (octaBDE) and decabrominated diphenyl ethers (decaBDE’s). Penta and Octa BDE’s are on the way out worldwide (are actually no longer produced in the US), but the chemical industry is waging a fierce fight to retain the use of the third major PBDE compound, Deca, which is the most widely used of the PBDE’s – about 50 million pounds a year in the U.S. alone. PBDEs are released into the environment during manufacturing operations, as products containing these chemicals degrade, or when the products containing the PBDE’s are disposed. SHORT ANSWER: PBDE’s are everywhere, they accumulate and they spread. And they’re really not good for us. Demand for flame retardants is up: The average “escape time” that a person has to get out of a burning home has dropped from 17 minutes in 1975 to only 3 minutes today, according to a study by Underwriters Laboratories released in October 2007. The reason for this is that plastics, from which so much of our consumer products are made, are made from oil, which is actually considered an accelerant in fires. And synthetic fabrics (according to the UL study) produce hotter fires and more toxic smoke than natural fiber furnishings. The higher fire load of consumer products and home decorations has effectively made home fires so dangerous that fire alarms sounding will often not provide adequate time for occupants to escape. The flame retardants for plastics therefore have become more critical than ever before. Increasingly stringent fire codes and flammability requirements, especially in building materials and consumer products, are driving demand for flame retardants steadily higher. PBDE use has increased 40% from 1992 to 2003, and is forecast to grow by at least 3% per year from 2011; they are ubiquitous in consumer products. Food is the major source of exposure for many contaminants, including DDT and PCBs. But food doesn’t seem to be the culprit in this case: Since PBDEs are used as additive flame-retardantsand do not bind chemically to the polymers, they leach fromthe surface of the product and easily reach the environment. In fact, The Environmental Working Group calculations show that dust is likely to be a more important PBDE exposure route for children than food, as PBDEs migrate from furniture and electronics into house dust. And they don’t stay put: Sit down on a foam cushion and you’re releasing countless, invisible PBDE particles. When the TV gets hot, still more escape and land in the dust in our homes. They rinse off our clothes in the laundry and run down the shower drain, winding up in sewage that’s applied to farm fields as fertilizer. And what about all that plastic in the ocean gyres or in landfills? It is slowly leaching PBDE’s. persistent: they bioaccumulate, or build up, in fish and cats and Orcas and foxes – and people. Our bodies cannot get rid of these contaminates, so our levels just increase over time. We eat PBDEs when they contaminate our food, particularly meat and dairy products. They latch on to dust and other particles, so we breathe them in, or ingest them when dust settles on food or when children stuff their fingers into their mouths. Scientists look for PBDEs in breast milk because the chemicals stick to fat. In 1999, Swedish researchers reported that PBDE levels in women’s breast milk had increased 60-fold between 1972 and 1997. Similar dramatic increases were documented in California harbor seals, ringed seals from the Arctic, gull eggs from the Great Lakes and human blood from Norway. PBDE pollution has been found essentially everywhere scientists have looked: in the tissues of whales, seals, birds and bird eggs, moose, reindeer, mussels, eels, and fish; in human breast milk, hair, fat and blood; in hot dogs and hamburgers and the cheese we put on them; in twenty different countries and remote areas such as the North Sea, the Baltic Sea and the Arctic Ocean, on top of mountains and under the sea. fat seeking: this causes them to magnify up the food chain, increasing in concentration at each successively higher level. Once PBDE’s are released into the environment, they invariably find their way into humans, including pregnant women, where they pass to the developing fetus in utero or through the breast milk to the nursing infant. As evidence of fetal exposure, the infant at birth has levels of PBDE’s that are up to 25% of maternal levels. 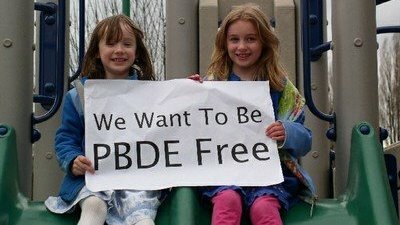 And researchers have found that children’s PBDE levels are about 2.8 times higher than their mothers. Research in animals shows that exposure to brominated fire retardants in-utero or during infancy leads to more significant harm than exposure during adulthood, and much lower levels of PBDEs are needed to cause harm to infants and children than to adults. In addition to their effects on thyroid hormones and neurological development, PBDEs have been linked to a gamut of other health impacts in laboratory animals, from subtle to dramatic. In-utero exposures have been associated with serious harm to the fetus, including limb malformation, enlarged hearts, bent ribs, delayed bone hardening, and lower weight gain. The malformations of the fetus were consistently seen at levels much lower than doses harmful to the mouse mothers. Only one commercial PBDE mixture has been tested for its ability to cause cancer, in a single study more than 15 years ago. High doses of Deca given to rats and mice caused liver, thyroid and pancreas tumors. What does all of that mean, exactly? I just saw your bolg and wanted to chime in. I am a big Fan of Ultrasuede and its new recycled version. All textile have a footprint. If a leather compnay sposered the design forum would you be as harsh as you are to Toray and Cargil?? The environmental impact of the textile industry has become a major issue for consumers, and when considering the environmental performance of fibers then the common consumer assumption is that “natural” fibres are more environmentally friendly than man-made or synthetic fibres like recycled polyester fiber. However this is a misleading and often inaccurate assumption. When handled responsibly then the production and processing of mad made® fiber compares favorably with natural fibres in terms of environmental impact. fiber is produced from chemicals which are obtained from oil. This, of course, is a non renewable resource. Yet it must be remembered than less than 1% of annual global oil production is used in the production of Nylon, a very small amount when placed next to that used in our cars in the same period. The energy locked into the large molecules can be partially reclaimed at the end of their useful life by efficient incineration combined with energy reclamation. Cotton uses large amounts of high quality agricultural land, requires large amounts of water for irrigation and, as cotton plants are very susceptible to pests and diseases, then large quantities of pesticides and fungicides are used in cultivation. The biggest impact from wool comes in the vast amounts of water and powerful detergents/solvents required to clean this very dirty fiber before it is processed into yarn. Regenerarated Cellulose Fibers such as Viscose These are produced from wood, a renewable resource but uses wasteful solvent based processes to turn the cellulose to fiber. This system has very high energy and water requirement. Processing and Use When it comes to turning fiber into textiles then Ultarsuede fiber comes into its own on the environmental front. The dyeing and finishing of fabrics and garments is one area which places major loads on our environment. But Ultrasuede fiber scores well here in comparison with natural fibres: Scouring of fibre before processing is much easier with a Mademade fiber. Because the fibre contains only a low level of oils, yarns can be scoured at a low temperature (typically 50ºC) and using mild, readily biodegradable detergent. In comparison cotton, for example, will often require bleaching and, as already pointed out, wool requires drastic high temperature, detergent intensive scouring to remove the grease from the fibre. You can also say the same for hemp and bambo. Dyeing Ultarsuede fiber is a very efficient operation, requiring shorter dyeing times than cotton and much smaller amounts of dyes and auxiliaries in order to make fast, level dyeings. The efficiency of Ultarsuede fiber dyeing also means that much less dye remains at the end of the dyeing cycle to enter the effluent stream. These and other points mean that the dyeing and finishing of Ultrasuede fiber require less water, energy, chemicals/dyes and the production of less effluent than many natural fibers. Useful Life once transformed into products and sold to the consumer then the fiber by no means ceases to have an environmental impact. Indeed this is the longest part of the fibre life cycle. Here too man made fibers compares favourably with natural fibres, the easier care, good dye fastness and quick and easy drying all contribute to man made fiber blend products require less detergent, less water and less energy to keep them looking good. I would like to hear what you think about leather, since most furniture deigners still use lots of leather.. Using products like Ultrasuede can make a huge impact on helping reduce pollution and create a much more eco friendly environment than using leather and suede. Lets look at furniture, footwear and apparel makers. Leather is the product of choice. Going animal friendly should be as important story as going Green is. Our saying that using faux suede is the worst thing for the enviorment. . Going Animal friendly can play a huge roll in helping improve the environment, working condition and educating a more compassionate society. Designers can make a huge global impact on human behavior and really bring about a change. If rock stars can put on global benefits to raise awareness on world hunger or genocide than it should be a no brainier for designers to start, using their influence to bring awareness to the fact that raising animals for fashion & Furniture is not that cool. Leather may be made from cows, pigs, goats, and sheep; exotic animals like alligators, ostriches, and kangaroos; and even dogs and cats, who are used for skins in China, Brazil, India, , Pakistan and many other third world countries which exports their skins around the world. Since leather is normally not labeled, you never really know where it came from. The vast majority of furniture in the West are now made in Asia. Asia has no real standards on the treatment of Animals used for footwear, furniture and garments. Unlike the synthetic suede makers that adhere to very strict manufacturing standards to treat water and the dyes that are re used in the process. There is no feeding, raising and transportation of live animals in the process of faux suede. The carbon footprint on the environment on man made faux suede and leather is so eco friendly compared to that of using animals, it is a no brainier. Consumers are getting the wool pulled over their eyes even with organic cotton and hemp and bambo. These product have a small life span and use huge ammount of natural resourcese to grown and lots of nasty chemicals to get the prouct to s state where it can be used in a textile.. You and your readers need to be educated on the fact that technology today can create a faux suede or leather that is more durable than and just as luxurious as that of animal skins. Not all people want to sit on hemp or cotton. although some leather and organic textile makers deceptively tout their products as “eco-friendly,” turning skin into leather also requires massive amounts of energy and dangerous chemicals. Often, animal skins used for leather are kept from biodegrading (going rotten) by using a variety of dangerous substances, including mineral salts (chromium, aluminium, iron and zirconium), formaldehyde, coal-tar derivatives and various oils and dyes, some of which are cyanide-based. All waste containing chromium is considered hazardous by the US Environmental Protection Agency (EPA) and other bodies. In an attempt to appear environmentally conscious, some tanneries are now trying to make improvements, but even if tanneries did not create any pollution, leather would still be bad for the environment. A spokesperson for the largest supplier of leather to automakers in the US said, ‘The last thing we want is people thinking we’re burning down rain forests for cattle just to put leather in big sport-utes’. But consider this: nearly half of all water used in the US is used to raise animals. According to the EPA, factory farms are the biggest source of pollution of rivers, streams and lakes. In December 1997, the US Senate Agricultural Committee released a report that stated that animals raised for food and leather produce 130 times as much excrement as the entire human population – without the benefit of waste-treatment systems. A Scripps Howard synopsis of the report stated, ‘Catastrophic cases of pollution, sickness, and death are occurring in areas where livestock operations are concentrated’. Locally, since 1988, some 30 tanneries in Ethiopia, Kenya, Malawi, Namibia, the Sudan, Uganda, the United Republic of Tanzania, Zambia and Zimbabwe have received assistance in pollution control focused on the establishment or upgrading of effluent treatment facilities. Hmmm… it all sounds yucky to me. But what can we use instead of animal leather that is better for us, the animals, and the planet? What about the alternatives? Many pseudo-leather materials have been developed, allowing those who wish to use leather-like to do so without actually using leather. One example of this is vegan microfiber, which claims to be stronger than leather when manufactured with strength in mind. Vinyl materials, Ultrasuede®, Pleather, Durabuck, NuSuede, Hydrolite, and other alternatives exist, providing some features similar to leather with out the pollution and mis treatment of animals. Faux leather and suede made by Ultrasuede has, according to the company’s Web site, ‘features to protect the environment like a biodegradable backcloth, no plasticizers, no stabilizers, no adhesives, extensive recycling in the manufacturing process-and no need for potentially toxic after-care’. I take my hat off to Ultrasuede for offering a eco animal friendly alternative to Animal skins. Do you where leather and sit on it? If you two sisiter really want to be eco friendly then maybe you both should go vegan! Are you wearing leather shoes and sitting on your leather sofa. Let’s look just at the production of the man made fibers vs. the production of natural fibers first, then we can turn to the dyeing and finishing. The reason a man made fiber – ANY man made fiber – cannot compare with a natural fiber is that the chemicals used to produce the man made fibers contain some of the most toxic chemicals invented by man! Not only is the feedstock extraordinarily toxic, but the manufacture of the feedstock creates hazardous by-products. This toxic chemical brew is then allowed to go to our landfills, where these chemicals leach into our groundwater, or it’s incinerated and they’re allowed into our air. A natural fiber, on the other hand, may be doused with synthetic fertilizers and pesticides – but the plant itself has changed little over the millennia and does not intrinsically harm humans. You neglect to mention the fact that organically grown fiber crops don’t have this added dimension of synthetic chemical fertilizers and pesticides. At the weaving/dyeing stage, Ultrasuede requires no water , and probably (though I don’t know for sure) can be solution dyed, meaning that the dyestuff is mixed into the polymer, thus requiring no water for dyeing – so you’re right again that it requires MUCH less water and creates almost no effluent. Plastic fibers such as Ultrasuede do not require scouring – and yes, wool scouring can be an environmental nightmare. But there is always the option of treating the wastewater from scouring and dyeing operations. That’s why certifications such as the Global Organic Textile Standard (GOTS) requires wastewater treatment, and why we urge consumer to support GOTS certified products. In other words, the Ultrasuede is intrinsically bad for you, whereas an effluent stream can be treated to be neutral – and the wool itself is not toxic. You did not mention end of life issues – what happens to that Ultrasuede at end of life? It goes to the landfill and enters the great plastic problem we’re beginning to cope with. It cannot be recycled into new Ultrasuede. What happens to a natural fiber? It can (if organically processed) become food for tomatoes. As for leather – we do not condone the use of leather. But there is a huge meat eating population on earth, and leather is a byproduct of this industry. Leather is a natural product, and would rot off your feet if not absolutely pickled in a highly toxic chemical bath. Tanneries are so bad for the environment that the US government kicked them all offshore. On the other hand, we think that holistic herd management can help our climate fight (see our blog post: https://oecotextiles.wordpress.com/2009/08/04/why-does-wool-get-such-high-embodied-energy-ratings/ ) at the same time that it ameliorates some issues associated with animal pollution and destruction of grazing land. We agree with you that Ultrasuede and other leather substitutes eliminates the problem of animal mistreatment – but to say they eliminate pollution is very much a mis-statement! At the end of the day, there are just so many people on this planet that almost anything we do can have a negative impact, which is why we need to be so careful about everything we do!